I'm so happy that you are visiting my blog and want to be in my Give Away drawing. I love to see your thimbles. Anne-Grethe don't have that many nice thimbles, but showing what she have qualefies her to be in the drawing. Gail have some nice thimbles. I simply love her crystal thimble. Never seen one like that. I also love Gails nice memories about each and every one of the thimbles. Nihal from Turkey also have a nice thimble collection. Of cause all of you will be in my drawings. I will have a new roundup at midnight. I finished OC part 2 on sunday, just in time for part 3 that was postet today. I will start soon. Mine is very very scrappy. I hope there is a step to bind all my blocks togheter. Are you curious what might will be in the Give-Away drawing? I have made this small purses to keep make-up, threads, spools or other stuff in. All purses have a beaded "thing" hanging in the zipper. Each purse have two secrets inside. You still have time to enter the drawing. All you have to do show your thimble collection on your blog, and leave a message about it on my blog. Timelimit is April 30th midnight my time. The drawing will be done May 1st. and blogged same day. Maria also would like to be in my drawing. I love that! The Give-Away drawing will be done May 1. I would love to see more thimbles from collectors. In the meantime I am working on the gifts. If you want to have a peek at the presents, check in later this evning. I still have not showed you all for my special thimbles in my collection. Below you can see some old silver thimbles. I don't know excactly how old they are. One of them show that it have been used a lot. The top is all warn out. DIL (to be) had her birthday last week. I made this Travel toilette/make up set for her. She loved it. This have been a lazy weekend, but I have finished step 2 of Orange Crush mystery. Also been working on gifts for PIF- participants. Still one spot left! Also made gifts to bee drawn May 1st. Just have some last finishing touchtes to do. I'll take photos and blog tomorrow. Some new bloggers want to be in my drawings for showing their thimble collection. Lorenza shows her thimbles. Also Dagmar at Quiltmoose shows her collection. They are both in the give away drawing. Today I would like to show you some of my silver thimbles. Thimble on left side is a regular silver thimble bought at a silversmith shop i Bodø. This one I bought myself. In the middle is a handmade silver thimble from Manilla, Philippines. This one I got from DH some years ago. To the right side is a beautifull thimble from Malta. This one was a gift from DS1. My scap bins are full and I have boxes of precut squares in different sizes and some boxes of strips. I need to do something creativ and put my scraps to good use. I started with my box of 2 inch squares and made blocks 5 by 5. Looking good? I thought so, but decided to add triangles to make the block on point. I love the result. Now I'm adding some applique. I'am looking forward to show you the result. My scap bins are still full! What happened? Did I not just make an entire quilt out of scraps? Some temptations are hard to resist. This time it is the Orange Crush mystery by Bonnie Hunter. Looking at some of my favorit Norwegian bloggs the temptation got me. In that manner I am in good company! Sølvi did it, Inger did it, so did Oddbjørg, Sigrun, Elisabeth and many many more. I have done 1th step already! On monday I'll start 2nd step. I make so many plans for new projects. Not all of them get carried out. Sometimes because new ideas pops into my head, somethimes because there is no time. For a long time I have intended to make a set of bags for makeup and stuff I need to bring along when traveling. Eventualy I did it! The set will be tested this weekend. Look at this special thimble that Teresa got!! It's special made to fit her finger. I am having so much fun looking at all the nice thimbles. Today I want to show you two of my handpaintet thimbles. Thimble to the left is a personal gift from A. Steen. I met her in 1999 when I went to Quilters Herritage Celebration in Lancaster. She was married to a Norweginan. Just one like this in the hole world! Thimble to the right side is a handpaintet thimble from Arendal, the town next to where I live. Very limited numbers of this thimble! The painter is S. Greger. I love this handpaintet thimbles. 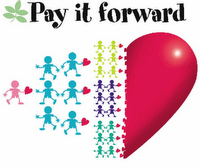 I hope there are more bloggers out there who want to sign up for Pay it Forward. I have some lovely gifts prepared! I am in such a Give Away mood. SMILE. This is an other opertunity for you to receive an handmade gift from me. I will send a handmade gift to the first 3 people who leave a comment on my blog requesting to join this PIF exchange. I don’t know what that gift will be yet and you may not receive it tomorrow or next week. But you will receive it within 365 days, that is my promise! The only thing you have to do in return is pay it forward by making the same promise on your blog. The first 3 people who comment will receive a handmade gift from me. Just make sure your coment on my blog leaves your e-mailadress so I can get in contact with you. I will answer your e-mail privatly to get your mailaddress. I knew there where some great collections out there! Just look at Lailas beautifull silver thimbles. Solfrid have the biggest collection I have seen so far. I just love her collection of thimbles from Svalbard. My mom also collects thimbles. She have not left a comment on my blog yet, but she is going to. I have some special thimbles I received as gifts from a dear friend in England. Left side: Ayshford thimble with William Shakespeares birthplace. I can not find any info about this one. Anybody who can help? In the middle: Birchroft thimble made like a Quilt shop ! To the right side: Museum collection thimble by William Morris. Flower motif Honeysuckle. Oh, it's so much fun to see your collections of thimbles. Just look at May Britts collection again. I just love her silver thimbles. Laila have not blogged her collection yet, but hopefully soon. Inger at Tiriltunge did not collect thimbles 8-O! Is that really true? Not a single one? Barbara at Just a little Zizzy have two posts showing part of her collection. Monica also have a nice collection of thimble. Just look here! Below you can see another part of my collection. This is "Thimbles of the Worlds' Porcelain Houses" collection from 1980. I have the complete collection of 25 thimbles. Inspired by May Britt I decided to have a closer look at my thimble collection. Mostly I have collected thimbles from places I have visited and places familiy and friends have visited. This i total view of my collection. Several years ago I took part in a thimble swap at an international swap list. This gave a flying start starting collecting thimbles. Most of my thimbles are porcelain or bone china. I have about 8 silver thimbles, new and old. My collection counts 201 as of today. I know I have some goodies for collectors too, allthoug this is not my main reason for collecting thimbles. Smile. Here you see two Staffordshire Fine Bone China thimbles. I love this two cat timbles! I can not fine any more informations. Anybody who can help? Would you like to show me your thimbles?? Leave a message at my blog and post a photo at your own blog. I will draw a give away price to three bloggers doing this. You don't have to have a big collection to participate. You have end of April. Drawing will be done May 1st. I have not decided yet what to make. DH went to Singapore for a business trip after Easter Holiday. When he returned I had already left for our Annual Quilt meeting. He is a nice hubby and braught back thise goodies for me. The fabric packs is collections of fq's so I just had to open them to show you. Smile. I don't have any specific plans for this fabric collection, but I'm sure they will come to good use. I am enjoying time in my sewingroom to destress from last weekend. A friend dropped by to day for a cup og coffee. She brought a wonderfull book: 5.500 Quilt blocks Designs by Maggie Malone. I just have to buy that book! You know what that means?? ;-) Yes, shopping on the internet again. Some patterns, white pen and fabrics from Northern Quilts. She have made a pattern for a darlig Penguine to keep a 3 liter bag of wine. From Lappemor I got black and white fabrics with cats and fabric pack in brown with hearts. Some precut hearts and fabrics from Lille Stasjon. I found red Moda fabric that I have been looking for from Kathrines Quiltestue. Quiltegaarden was vote as best shop. I got books and fabrics there. I also bought an interesting thing to thread ribbon or string in a draw-string-bag. The thing is called Easy Threader and I got it at Lena's Knits and pieces. This weekend have been exclucive, exciting, exhausting and a great experience. More than 600 participants pre registrated and about same number of local visiterts. About 400 quilts at display in addition to a nice collection of pincushions. On Friday evening we had a soup dinner. This is May-Britt and me having a ball!! As a member of the organizing commity I had a lot to do. This is a quiet moment sunday at the lottery booth selling lottery tickets to my mom and a friend. May-Britt supplied me with both photos because I did not bring my camera. Tomorrow I will show my catch in the shopping area.